It has a massive body which can weigh nearly two tonnes, a length ranging from 2 metres (females) to nearly 4 (bucks), a thick, rough skin that protects it from the cold, a beautiful moustache and especially an impressive pair of tusks, this marine mammal is only surpassed in size (in its controversial order Pinnipedia) by the elephant seal (Note that the walrus and elephant seals are two different species). Females only give birth to one young, after a gestation period of 15-16 months. The calf (which is what baby walruses are called) weighs over 50 kilogrammes at birth and will only leave his mother after 3-4 years. Males wait on average more than 10 years before they reproduce, while females are ready to reproduce after about 5 years. Essentially in the Arctic Ocean and nearby areas such as the Bering Sea and North Atlantic. Finding its food at the bottom of the sea, it stays in the shallow waters of continental shelves where it can dive in and search in the sand. It also appreciates the icebergs and ice sheets that serve as a floating base. Mainly molluscs (bivalves, cockles, carpet-clams, clams, etc.). But it is not averse to crabs, shrimp, octopus, etc. and even soft corals and sea cucumbers. Its morphology is so huge that it must eat tens of kilos of food every day. Particularly due to its famous moustaches, which are called "whiskers" and are actually an organ of touch which it uses to dig in the sand to search for its favourite shellfish. Diving usually in groups, it can stay up to half an hour underwater and reach a depth of 100 metres. Is it a sociable animal? The walrus is an example of a social animal, as it lives in herds that can be very variable in size (groups ranging from groups of tens to several thousand). Although they live in contact with each other, a hierarchy exists among individuals, with the top dominant males being the ones that have the best defences and morphology; they may even form harems. It seems to be impossible, given its size and its natural weapons which are a formidable defence, but despite this, its main natural predator is the killer whale, which has a mass more than double its size and whose greed is legendary. Walruses must also be wary of polar bears attacking their colonies, although the solidarity of the group is such that the bear can only really threaten young ones or isolated individuals. 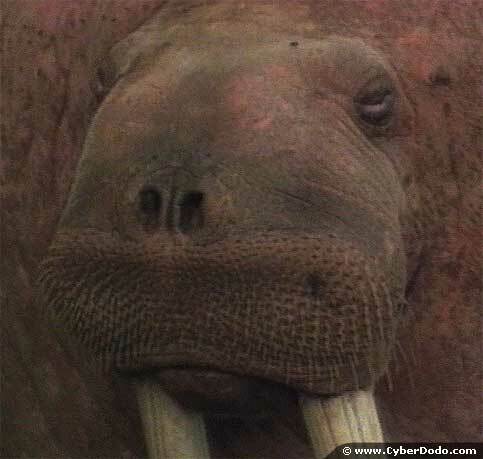 However, it is difficult to forget the species that is the biggest threat to walruses: man! In the eighteenth, nineteenth and early twentieth centuries, it was hunted intensively, especially for its ivory, blubber and meat, which almost destroyed the species. This slowed down in the second half of the twentieth century and walrus populations increased when commercial whaling was finally banned. But other threats have emerged, again because of man ... What is the current status of walruses? But the disturbance caused by man does not end there; scourges such as pollution and overfishing are also a part of it. Not to mention ecological disasters such as oil spills that destroy its habitat for a long time. The condition of walruses may be considered a relevant indicator of the state of our planet. Living far away from man (The indigenous people of the Arctic hunt for their needs and this has never been a threat to the survival of the species); they should live a peaceful life in their cold regions. Quite the contrary, even "up there" the environment is degraded and attacked with serious long-term consequences.